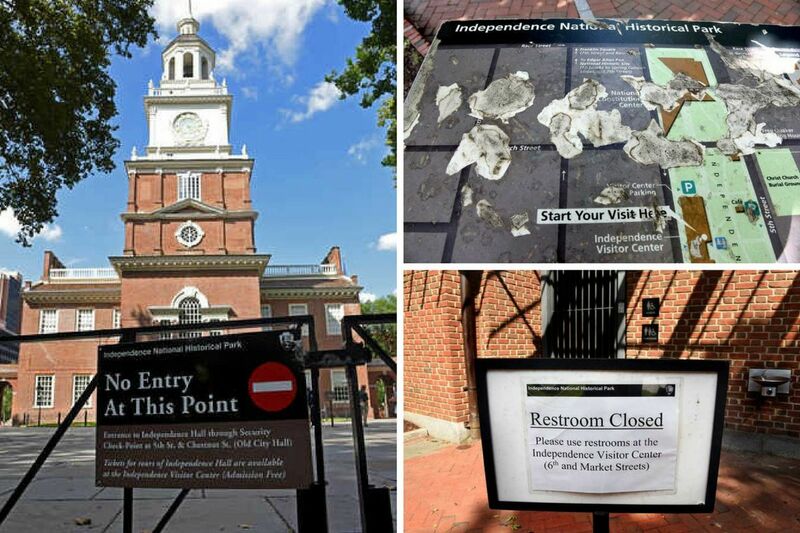 Clockwise from left: “No Entry” sign in the rear of Independence Hall; deteriorated signage on the mall in front of Independence Hall; closed restrooms in front of Independence Hall at Fifth and Chestnut Streets. Last week, our Editorial Board wondered: Why do we tolerate the mediocrity of Independence Park? After talking to experts, tourists, and other stakeholders — including a school-trip-age student — it was clear that Philly residents have ideas for how to improve the park. Readers also shared their ideas reimagining the space. Here are a few of the most intriguing suggestions. Add a reflecting pool to create dramatic sight lines. Implement a 18th-century dress code for all Old City workers. Add flower beds of splendid colors. Extend the lawn to cover Market Street between Fifth and Sixth. Call upon the Phillies and Eagles organizations to manicure and maintain the grass to the quality of their playing fields. They should be asked to cover this bill as civic partners and ambassadors of the city. Build beautiful pedestrian bridges and walkways. Focus on historical plants and trees. Independence Park was never meant to be a show garden like Longwood Gardens. It was meant to help tell the history. The park’s historic and well-designed landscapes should not be altered just to achieve a current version of what we currently think is pretty, any more than we would change the paint colors in Independence Hall to follow current fashions, or make unthoughtful changes to significant architecture designed by a respected architect. Fly the flags of the 13 original colonies. Build an American Indian museum. My expensive idea is a museum focusing on Native American history on the East Coast, prominently situated on the mall. The Penn Museum has an interesting collection of American Indian artifacts that is underutilized in its current space. The opportunity to revive the story of Native Americans in colonial America would also be a powerful fund-raising opportunity attractive for many of the same groups behind the Smithsonian. Stop hiding the Liberty Bell. Build a Revolutionary-theme casino, turn the Constitution Center into a water park. A look back at history: How Independence Park brought drama from the start. What the future could look like: From Ed Rendell to “Betsy Ross,” we asked Philly luminaries to reimagine Independence Park. From the archives: Inga Saffron reviews the 2010 revamp of Independence Mall.